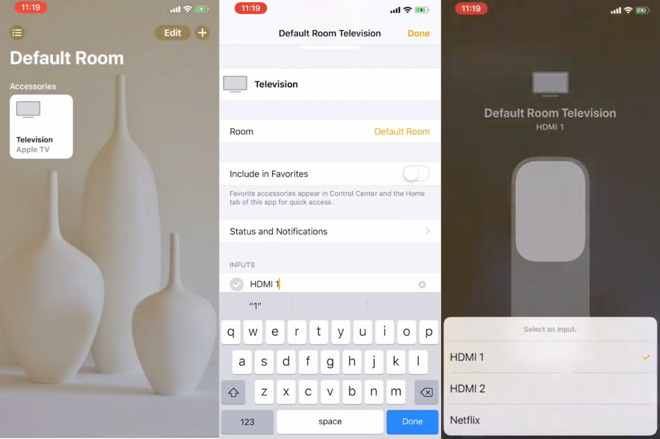 AppleInsider already looked at the capabilities of HomeKit TVs, and now those features can be tested with the iOS 12.2 beta which has added the intitial support. We've also learned a bit more about how iOS will interact with TVs. When added to HomeKit, the TV will show in the Home app like any other accessory. It will show the current state, content can be played or paused, and the input can be switched. Inputs can be renamed to reflect their purpose —such as "Input 1" becoming "Apple TV". Currently, that is all the functionality found in the Home app. Other functionality, such as navigation and menus, is tucked into the Remote widget contained inside Control Center. It will likely be added to the Remote app upon full release as well. Using the Remote widget, different TV controls can be exposed such a directional pad, a back button, an info button, and more. This should allow nearly any TV function to be controlled solely using your iPhone. Now that all of this functionality is added to HomeKit, scenes can be integrated with them. Movie time can now not just adjust the lights but can turn on the TV and switch the input as well. Developer Aaron Pearce also simulated adding a TV to HomeKit to show off different aspects that could be configured. Several manufacturers have already lined up to launch HomeKit TVs this year including LG, Sony, and Vizio.